Majumdar tests the Quadcopter prototype to determine how the drone can self-regulate and operate to immediately respond in different environmental conditions. 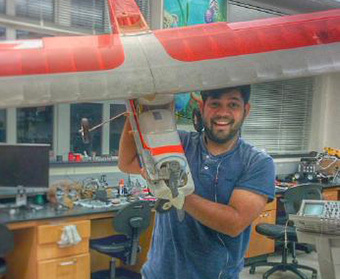 (Oct. 29, 2018) -- Abhijit Majumdar is an electrical engineering graduate student at UTSA. Not only does he mentor students and teach the fundamentals of robotics, but he also works in the Autonomous Controls Engineering (ACE) Lab on campus which develops capabilities for self-driving vehicles. Majumdar is a part of a UTSA team that helped launch the BMP Network Solution, an offshoot of a recent partnership with Bank of America. Among his peers and professors, he’s known for his ability to constantly prototype inventions. Can you describe some of the prototypes you have built? My research focus is on intelligent self-learning robotics. This had led me to develop prototypes for several different kinds of drones, an AI system to securely monitor an area under observation and alert authorities for abnormalities. I’ve also developed simulations for autonomous cars and drones learning to drive and therefore avoid obstacles along the path while they navigate towards a goal. To help the elderly or blind population walk through a cluttered area, I constructed a smart walker, and in agriculture, I built a monitoring device to measure the content of nitrogen in plants during fertilization. When did you first prototype or invent something? I was in the 5th grade when my dad bought me a book which showed different circuits to build. I tried to build a temperature monitoring alarm—it didn’t work! How do you see yourself? An entrepreneur or innovator? Is there a difference? I like to think of myself as more of an innovator, since I wouldn’t want myself to be constrained with “profit margins.” I just like to try some cool inventions. Although, I would like to see my innovations put to good use and benefit others through a company I start up. How does it feel to already have patents under your belt and how many do you have? It is exciting to see some of my research actually being useful to the community. The patent is just a step in formulating the work into a viable product. Currently, I have one filed and another in the process. Is innovation something that you work at like a muscle? Definitely. You need to keep at it, all the time. But that is what brings in the drive to do it, the prospective result of the effort and the understanding on how ones’ innovation could be useful to others. How do you feed your curiosity? How do you get inspired to create? Keep exploring and never stop looking. It is usually difficult to convince me that something works in a particular way without providing enough proof, and that is what I seek. Your mentors might not always be available to answer all of your questions; however, they can point you in the right direction. That is usually enough for me to start digging deep into “what”, “how,” “why” something works. Inspiration to create is easy, once you learn how something works. It’s like when you give a child a crayon and show how you can draw a stroke, it opens up his creativity to paint a picture of his imagination. What are your plans after UTSA? I have been hired as an Artificial Intelligence Robotics Engineer at PlusOne Robotics, where I start work after I graduate this upcoming December. The company makes smart autonomous robots that will work to better handle logistic operations and work in harmony with humans. Name a person who inspires you that most people would be surprised to hear? It’s not a surprise, but my greatest inspiration is my dad. He’s a research scientist at the Central Institute for Cotton Research and develops cotton harvesting machinery. He builds and develops several prototypes, however, the most inspiring undertaking from his work is when his prototypes and ideas are finally realized into products and put to practical use. What advice do you give your friends? “Hungry raho,” which in Hindi translates to “stay hungry.” This was advised by a friend, Ruta Dandekar, who intended to say, always stay hungry for food, exploration, curiosity, work and life. Learn more about the UTSA Department of Electrical and Computer Engineering. Discover a degree with the UTSA Graduate School.